I've just had the most indulgent weekend in terms of food and wine, and it ain't over yet. I went to an in-law family wedding in Pennant Hills in Sydney, on the way there and back made a flying visit to some friends who have just moved to Sydney, and all along the way ate the most incredible food and drank a lot of vino. Then drove back first thing today to have a celebratory birthday lunch with my parents (it's the last day of the 30s today) at a very nice Canberra venue. Bumblebee wasn't allowed to come to the wedding (classic family-type wedding, BTW, all the regular eccentrics to keep the reception ticking) so he went to Cootamundra with Colonel and Lady Duck for a reunion of some obscure branch of the family tree, and then back again for this lunch. In a desperate attempt to stop eating and drinking we took Bumblebee to the movies this afternoon to see Stardust, which is terrific but visually as rich as some of the food we've been eating, and so now I feel bloated and queasy. 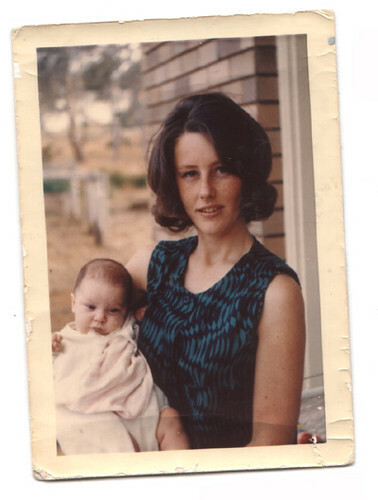 Happy Birthday to a fabulous mother, someone who has travelled to Hell and back and lived to tell the tale, and still remains a beautiful individual, inside and out. I feel like such a glutton. This Lifeline fair was pretty lousy for kid's books, according to Bumblebee, who kept his eyes peeled for Time Team books, but didn't find none (sorry, Mouse!). He found a few things he liked, but not many. I didn't bother with fiction this time; the pile beside my bed is too high. Plus I was too excited by the fact that the Canberra Public Library and the Canberra Museum and Gallery had both had huge chuck-outs over the last 6 months, and there was the most amazing quantity of the kinds of books I like to look at (and read, over time). Mostly hardback volumes of poetry, printed in the 40s, 50s and 60s by publishers like Edwards & Shaw, Jacaranda Press, ANU Press and Angus & Robertson. All, of course, stamped and stickered, but nearly all in mint condition thanks to the fact that very few people borrow poetry from libraries. I've been doing up them up a bit, removing the stickers carefully, and the library coverings (I have my own acid-free book plastic), and I'm very pleased with my efforts. I find the best way to tackle the book fair is to go on Friday sometime, and then again on Sunday afternoon. I couldn't make it until friday afternoon this time (around 2.45), and was pleasantly surprised at the lack of crowds. That first visit is when I buy things that I know will be gone on Sunday. Anything I hesitate over gets left to chance. On Sunday afternoon they sell a green Woollies bag-full for $10, and I can fit a lot into one of those bags! And nearly everything I'd left was still there. Actually, I discover that I took that photo in April 2005! Finally, I plonked it in the bag. Only to get home and discover that the title poem has been ripped out! Heh. I now plan to take off the cover and make it into an altered book. I think my best find (apart from one which I SWEAR I will blog in the next two weeks; it'll be a long post, and I'm a bit time poor, but god will strike me down if I don't share it with you) was a copy of Nan McDonald's The Lighthouse (poetry again), only because I'm trying to find everything I can of hers, and I found this at the very last minute, on a hastily-put-together poetry table that wasn't on the map and I found on the way out. 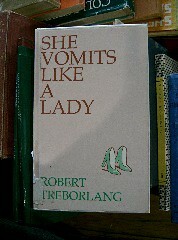 Along with other beautiful volumes. Seriously, I bought over 65 volumes of poetry, about 2/3 of it hardback and more than half of it via the green bags. Not all of it is stuff that I'll read closely; many of them I got for their design and cover production. One volume is a small-press letterpress production with beautiful deckled paper edges and a really natty cover by an Australian press I'd not heard of, but I'll do some research on now. There's something about those very formal hardcover volumes that I love, especially the uniformity of them on the shelf. And their covers are quite often very simple but very elegant printing, and looking at the real thing is always so much better than seeing reproductions in bibliographical studies. Most of these will be boxed up until I can set up my studio, where they will be looked at regularly. It's the print-nerd equivalent of loving 1940s fashions, and collecting vintage things to wear. I also bought some old hardbacks and children's encyclopaedias to rip and tear and alter, as part of the Sturt Summer School I'm teaching in January. How could I resist an old novel called The Maker of Heavenly Trousers? Bumblebee just startled me by appearing at the door of my study wearing an old purple slip of mine with two plastic Pokemon balls in the chest area as breasts (if you do not have boys, Pokemon balls are quite spherical, but the have a flat rim on one bit so they can sit flat on a shelf, and they sit well on a flat chest!). With his shaggy hair he looked amazingly female, like a 1960s actress playing in Streetcar Named Desire or something. He posed, put on what he thought was a feminine voice, and I caught a flash of the daughter I've never had, but twenty years down the track. It was a very weird experience. And then we cacked ourselves. He's such a little monkey. Yes! The rumour is true, Mindy! 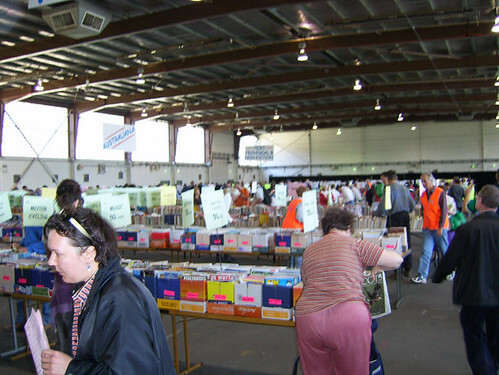 This weekend is the Lifeline Book Fair, at Exhibition Park, Canberra! Be there or be as square as that nice lady's pink behind! Watching this (and I highly recommend you at least listen to it) almost puts me off Facebook. Almost. To tell the truth, it's the scrabble that keeps me there. Playing around ten games of scrabble a week simultaneously with people I like (but haven't necessarily met) is a fantastic thing. I know I could do it outside facebook but I haven't the energy to organise that. For me, playing online scrabble in bulk is like being involved in a surreal game of concrete poetry. The next word I put down isn't always influenced by what letters I have on my rack, but also the 'tone' of the game, what words have been there before, and whether I want to make my opponent smile or not. The juxtaposition of words that emerge sometimes bends my brain, and that's a wonderful thing. I'd rather have an interesting board than win the game. -- Bumblebee shifting his Sith casualwear uniform to Jedi casualwear by incorporating cut-off jeans (I decided, since he's shooting up so fast, to cut the bottoms off his jeans to look deliberately short rather than outgrown), a t-shirt that says 'Trust me, I'm a Jedi' and a pair of black and white trendy runners (the flat kind, with seemingly no sole). He walks around like he's Vinni Barbarino (age-appropriate reference). The hat remains on his head, on top of the carefully cultivated shaggy hair. heh, don't get me started on that one. Let's just say that if anyone gets knocked off their bikes on the Marcus Clarke side of the campus, please take the ANU to court for being culpable. *Long ago (I'm sure I've mentioned this before) in the deep dark mists of time I spent about 18 months as a taxi driver, as a way of escaping a horrendously boring retail job turning around coathangers on racks in a women's clothing franchise, and before I managed to land a slushy little white-collar job in local government (which I also gladly left when my contract finished). I quite enjoyed taxi driving, and chose to drive at night, preferring to face drunks rather than the old ladies with shopping going only five metres. Anyhoo, I would add a Suit Fee onto rude Public Servant passengers' cabcharges (the ruder they were, the less likely they were to write a total on the bottom of their forms) and offset this by giving needy people lifts (like young women walking home late at night, when the buses had stopped. It gave me a Robin Hood-like satisfaction that made the job fun. 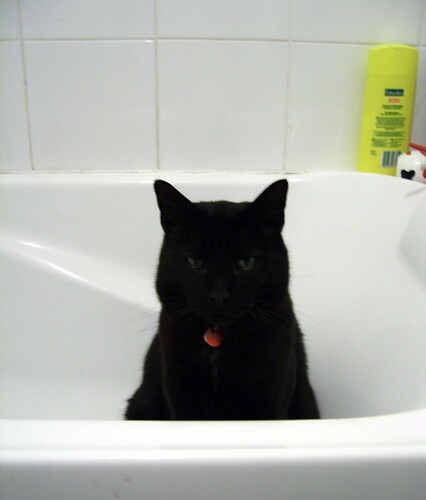 Mr Padge likes to drink from the bath. 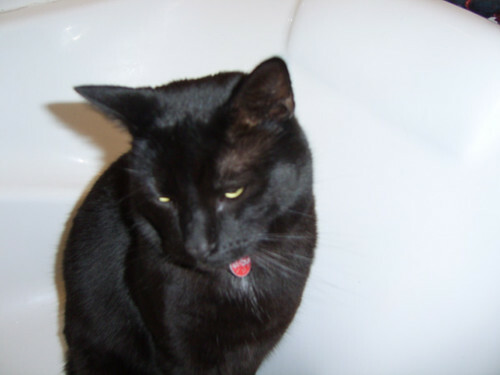 He especially likes to jump into the tub just before it totally empties, and drink the warm bathwater as it swirls around his ankley-bits. I've put him in when the water is as deep as his knee-bits, as he seemed to enjoy it immensely. 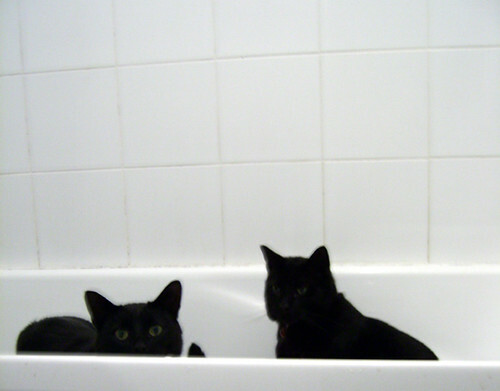 Pooter, on the other hand, won't jump into the bath unless it's completely empty, and jumps out again if you put the plug in to add a little drinking water for them, only returning when there's no chance of splashing. 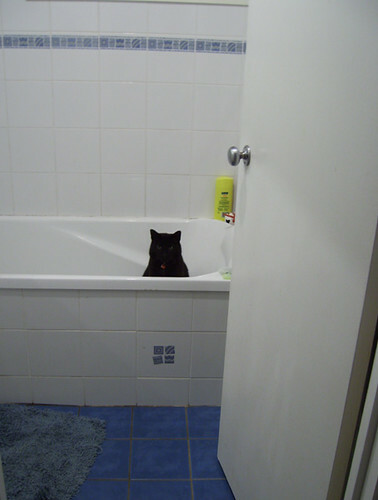 Lately Padge has taken to waiting in the bath at odd times of the day, hoping someone will notice him. And it can be quite spooky, walking from one room to another and having this dark shape catch your eye. 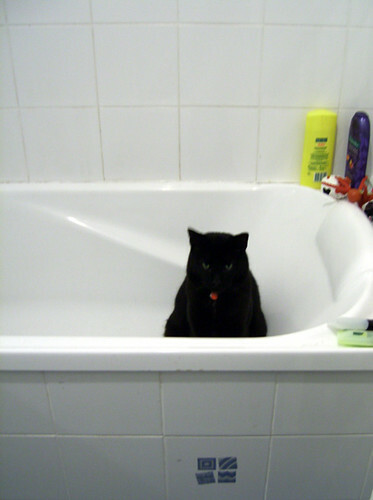 And he just sits there, until you actually lean over the bath for the plug. And then he gets all modest and bashful, as if to say 'but only if it's not inconvenient to you at this time', and gets all lovey-dovey, and the purr like a chainsaw kicks in. But he got bored within a minute or so and went back to hanging out in the kitchen, where he waits for someone to open the fridge or start chopping something. He's never very far from the fridge, that cat, even though he's the skinny kit. "Auntie Naomi is graduating today. From now on she'll be Doctor Naomi!" "Not a medical doctor, an academic doctor. They know a lot, just not about medicine." "Well, yes. Naomi is more like Doctor Who than Doctor F [our family GP]"
Yay, Naomi. You've achieved ultimate coolness. Congratulations! Best Beloved flew to Sydney this afternoon in preparation for an early meeting tomorrow. It's the end of a Parliament Sitting week, and BB found the airport chaotic and full of grotty politicians. He wishes he'd flown tomorrow in the morning now. According to the email he sent me from his Slaveberry, he shared the plane with Downer, Ruddock and Turnbull. Euwk. The only thing wrong about Canberra is Parliament. Send it back to Melbourne! They can deal with the ejits. Julia Gillard, was the amused answer. Tuh! Hussy. Tinkling her foxy laughter behind my nice young man. Still, at least she has taste. As does he, I like to think. One of the best jokes on Sideshow tonight was the one about John Howard calling an election at 1 minute to 6pm on the day of the election, allowing just enough time for he and Janette to vote, and making the rest of Australia pay fines, causing a huge Budget surplus... if only he could be sure which way Janette would vote. Boom-tish! Printed using metal and wood type, on a nice creamy coated stock, it is an ornament to any wall or office cubicle. Yes, they are for sale, at my newly created duck shop. The payment options are a bit primitive, but the service is very friendly. The edition is only limited by time and energy and relevance. Hopefully this poster will only be relevant for a few more months and then it will be a splendid souvenir of a revolting era. Or else I'll be selling it to you from New Zealand. You are also very welcome to snitch the digital image and pass it along, as long as you acknowledge the source. But they are rather glorious in their original hand-set letterpress state. Full acknowledgement is given to Crazybrave for awareness of the fabulous term Arsehattery, which covers just about every political evil. Today, I am chuffed to offer you one of my favoritest news stories presented by one of my favoritest comic artists, Mandy Ord. Glorious! 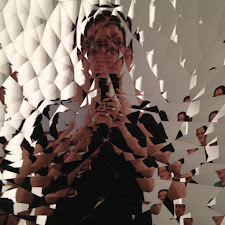 If you like her work, she's started a blog. And you can find her in various comic shops, usually in compilations. But I hear on the grapevine that she's working on a graphic novel, which makes me very happy. I didn't end up going to the blogmeet. Apparently no one else did either! God, Canberra rocks on. I don't know what anyone else's excuse was, but mine was/is sheer exhaustion. I didn't think I would be missed, since I'm not the centre of the Canberra blogging world. I went over to Zoe's for a while and had a whinge about how tired I am. She had a whinge back (it wasn't a competition! She wins hands-down. 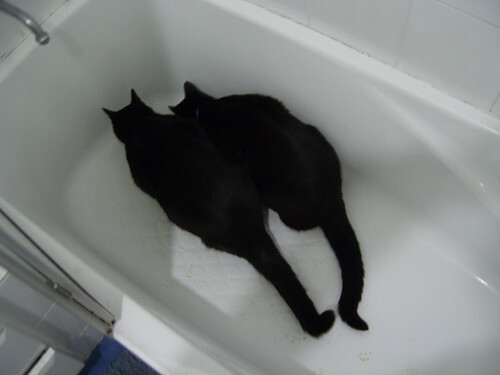 It was a bout of empathetic whinging) and by the time we were finished neither of us were going anywhere except bed. So apologies, anyone I let down. But if I was the type of person who enjoyed a rowdy pub outing I wouldn't be a blogger. Or at least, the type of blogger I am. Today I dragged myself reluctantly out of bed to go to the markets. I pulled on some vaguely filthy mismatching clothes from the floordrobe and did my duty, buying a rhubarb and apple pie for brekkie amongst other delectables for the week. When I got home I read my mail over a cuppa, because I haven't had the chance to check it for a couple of days. Shock! Horror! It is AFI film judging time and I missed the grand opening! The first films screen today! I checked my watch, first one started in 20 minutes. A quick conferral with BB decided that he'd seen two of them, wasn't interested in the third really, and maybe I should just go alone and he'd mind the boy. Within 15 minutes I'd been dropped off at the War Memorial theatrette with my bike and bag, still wearing my floordrobe glory and sporting a very tufty ungroomed head of hair. I hope I didn't smell too bad. I sat away from people, just in case. I worked out today why I like to watch romantic comedies and re-read favorite books when I'm tired and stressed. It was an epiphany, one that probably underpins our culture, and probably no mystery to anyone else, and I've probably had it before, but I have the memory of a goldfish, so indulge me for a mo. I have a lovely smooth, shiny veneer. I'm friendly, I make jokes, I'm relatively calm and patient on a daily level. When I feel stressed or sad, I try not to crack up by papering over the little splits with well-loved comedy and words and lashings of chocolate. If I need a cry, I'll do it behind glass or in the dark (like in a car or in a movie). But the mending paper I use has to be soft and well-worn. It has to be familiar to the touch. If it's bright and shiny and new, it doesn't stop the cracks from getting wider, and the splits open up to expose my cranky, raw and overly-emotional bits. Last weekend I used something new to try and feel better and it broke me into bits. And since I haven't had any kind of rest since then, today's bright shiny movies have done the same thing. I'm a wreck! I just cried all the way home on the bike. First I saw The Home Song Stories, which is a wonderfully poignant tale about growing up in 70s Australia with a self-destructive (and non-white) parent. Suicide features prominently, and the way the story is structured (in retrospect, from the POV of the child who remains) pulled me into bits. Then came Razzle Dazzle, which I have seen, and which I thought might pull me back together, nice soft, worn paper. But then the session finished with Noise, which BB had seen and highly recommended. Oh! Have you seen it? That last scene, that ending! Hence the crying all the way home. This can't go on. I need to be able to talk to people without yawning or crying. So Monday is going to be a Mental Health Day. No computer, no work, no child. I plan to sleep all day, eat gooey food and watch something completely meaningless. And then hopefully I can rally and get on with my books. And website. and stuff. I hope your weekend is restful and fun!